I've been getting worried that in the end I'm not going to like the decor of the house. We've started to talk about decor, and colors, and stained glass, and mason jars, and all this other stuff. Stephanie has some very strong ideas about what she doesn't want, and I'm more flexible (I think-- but maybe everybody thinks they are very flexible) - or at the very least I don't have very strong ideas about the decor. We've been joking about the color of the kitchen cabinets, and I keep saying "Clown decoupage" and Stephanie seems very against it. It's not that I so really desire clown decoupage kitchen cabinets, but I want to make my impression on the house. I can imagine a very cool, bright colored kitchen, with reds and blues, and silver metal, and a mechanized tightrope walker that walks from one end to the other on a little motor. It's not what I have been dreaming about or anything, but I can imagine it. My fear is at the end, it will be very "understated" and very professional looking, but not very fun and festive. I don't really want something that Martha Stewart would approve of-- I want to have my input and stamp on it as well. I'm not sure what choices I would make EXACTLY, if it were up to me alone, but it would probably be very quirky, and very weird, and perhaps overly "clowny"
Also, we've been talking about color-- I want very bright colors, but Stephanie seems to want very muted colors. I had a thought that maybe one wall of the dining room or living room could be a rich thick color that contrasts with some of the more muted look. Stephanie and I talked, and I think we've come to a better place about it. Two words-- circus bathroom! 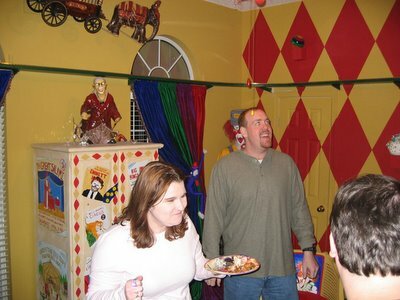 Okay, I did a search on google on "clown room" and found this photograph-this is NOT what I'm hoping for! Comments on "The clown decoupage...."